I don’t think I’ve ever said this, but there are too many shows airing on Monday nights. More specifically, Monday nights at 10/9c. My Google Calendar can’t show me the titles of the five shows I should be watching at that time, and I’m pretty sure I’m forgetting something but that time slot is just too stuffed to even care. As of right now I think I only have Bitten, Castle, Intelligence, Teen Wolf, and The Blacklist. If I’m missing something, please let me know. I still haven’t caught up with that hot mess, and I have a feeling it’s only going to get worse. While I understand the healthy competition, I feel like it would benefit everyone if we didn’t all try and air top shows at the same time. My DVR can only record four shows at one time. Give it a break! It is now Friday, and I’m still not caught up with all that has aired this week (which I’ve normally done by now). I’m definitely blaming Mondays front loading all my entertainment. How far have I gotten, you might ask? Sunday. I look at my Monday shows and just start to cry. Well, I might not cry, but I definitely cower a bit in fear. Nothing can break down that wall, not even the plethora of Christmas presents I have to finish knitting (don’t judge… they may or may not be Valentine’s Day or Easter presents by the time I’m done). I admit, Sunday was a doozy that I still need to process, but that doesn’t mean Monday should be bogging me down like this! 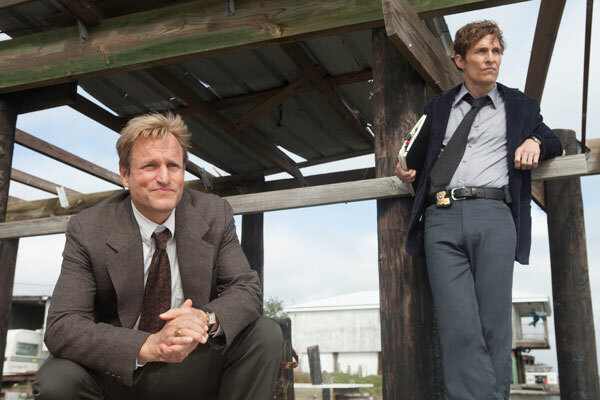 On Sunday I only had True Detective, which is going to be a very interesting ride. I love Woody Harrelson, and every time he plays a more serious role I’m blown away by his versatility. True Detective is no different. I think I kinda know the direction it’s going in, but I’m probably wrong, so I don’t want to dwell too much on it. Also, visually stunning. I mean, it’s no Hannibal (which I’m totally addicted to and need more of yesterday), but it definitely is an engaging viewing experience. I’m definitely looking forward to more. Also, shout out to whoever has to put on (and take off) Woody Harrelson and Matthew McConaughey’s hair pieces every day. Well done! Of course, since today is Friday, I only have a couple days to catch up on Monday’s hot mess. It’s going to be an interesting weekend. And of course by interesting I mean sitting on my living room chair and knitting up washcloths like they’re going out of style. My knitting kicked me off the couch some time mid-December.